Renowned horror novelist Mike Enslin (John Cusack) only believes what he can see with his own two eyes. After a string of bestsellers discrediting paranormal events in the most infamous haunted houses and graveyards around the world, he scoffs at the concept of an afterlife. Enslin's phantom-free run of long and lonely nights is about to change forever when he checks into suite 1408 of the notorious Dolphin Hotel for his latest project, "Ten Nights in Haunted Hotel Rooms". Defying the warnings of the hotel manager (Samuel L. Jackson), the author is the first person in years to stay in the reputedly haunted room. Another bestseller may be imminent, but like all Stephen King heroes, Enslin must go from skeptic to true believer - and ultimately survive the night. $20.617 million on 2678 screens. For yet another adaptation of a Steven King horror story, we go to 2007’s 1408. The film introduces us to Mike Enslin (John Cusack), a travel writer who specializes in guides to allegedly haunted locations. Left embittered after the death of his young daughter Katie (Jasmine Jessica Anthony), Mike doesn’t believe in the paranormal, and his cynicism comes through clearly. Most of the inns and hotels Mike visits welcome him and the publicity he brings, but he encounters an exception: the Dolphin Hotel in Manhattan. He gets a tip about its room 1408 and learns of its bloody history, as an astronomic number of deaths occurred there. The folks at the Dolphin don’t want to let him stay in 1408, but after a lot of pressure, he finally gets into the room. 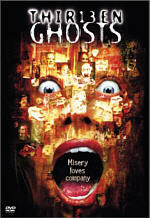 The movie follows all the spooky events that take place when Mike tries to survive his time there. Usually when filmmakers adapt a literary work, the challenge becomes how to cram all the printed material into a roughly two-hour flick. 1408 comes with the opposite problem. Taken from a short story, it needs to stretch a brief tale into a feature-length product. How does it solve this dilemma? It makes everything go really slowly and beats its themes to death. When I saw 1408 theatrically, I felt relieved when it ended because I thought that finish would never come. Slow and redundant, it threw the same attempted scares at us over and over again to the point of tedium. And that’s the main impression I take from 1408: boredom. Not that I think the movie was doomed to that fate, as I actually feel it comes with an intriguing premise. It gives us a clever twist on the usual haunted house tale, even if it does usually feel like The Shining crossbred with Groundhog Day. Unfortunately, 1408 works better as a premise than as a feature film. It throws cheap scare after cheap scare at us, each one with diminishing results. I don’t think any of them actually frighten us since we can see them in advance, but even if the first couple work, the rest fall flat. Very little about the events in the room comes across as clever or interesting, and the drama just gets stale very quickly since it comes without surprises. The movie’s lack of logic doesn’t help. On various message boards, folks have tried to read into the movie. For example, some speculate that Mike dies in a surfing mishap early in the film and 1408 is purgatory. This concept makes sense in a lot of ways, especially since the surfing scene otherwise seems extraneous, and the movie integrates it so awkwardly that I get the impression something strange is afoot. If the filmmakers intended the surfing sequence to become meaningful, they followed up on it poorly. I don’t want to spill any spoiler beans, but I think that the ending is too literal for us to latch onto the purgatory idea. Whatever intriguing threads we see lose their punch by the end of the film and we’re supposed to read all the events in a literal light. That’s too bad, because at least if 1408 managed some mystery about all those elements it might’ve become more compelling. With everything wrapped up in a neat little bow, the ending becomes even more of a disappointment. At least some unusual subtext might’ve given me food for thought and a reason to consider the film more than just a cheesy haunted house flick, so this comes as a missed opportunity. I also don’t care for the film’s lack of internal consistency. It constantly rewrites the “rules” to fit its own ends. For instance, we learn early on that no one ever survived in 1408 for more than an hour. To drive home this point – and further spook Mike – a digital clock counts down from 60 minutes. However, when this occurs, Mike’s already been in the room quite a while. He might even have been there more than an hour before the clock starts, but at the very least, he’s occupied the room for a good half an hour. That time doesn’t count? Not in the film’s world because those behind it want to shape events for their own desires. Logically, the clock should’ve started as soon as Mike walked in the room. If that’d happened, though, we wouldn’t have gotten the set-up of banality. Mike first must see the room as dull and without threat before it can work its terror on him. As storytelling, this makes sense, but it lacks logic. At least Cusack does well in the lead role. It’s an interesting change of pace from the usual likable romantic leads he plays. Cusack presents a good performance, as despite our nice guy preconception of him, he pulls off cynical and bitter pretty well. He also lends an average guy feel to the character that allows us to put ourselves in his shoes. Unfortunately, Cusack’s efforts get wasted in this slow, muddled film. Too long and too boring, 1408 starts out in an intriguing manner but quickly loses steam. This is a dull flick. Note that this set includes both the theatrical edition and the “Extended Director’s Cut” of 1408. The latter runs about eight minutes longer and makes a few changes. Spoilers ahoy! The primary difference comes at the end. In the theatrical cut, Mike lives and gets back with his wife. The Director’s Cut changes this. Mike dies in the fire but potentially remains present as a ghost. The DC also offers a little more in the body of the movie. Since I only saw the theatrical version once, I don’t think I noticed all the changes, but the DC does provide more with Mike’s dad. We get a slightly better sense of that character via a few shots. For the most part, though, the two editions remain pretty similar. Though darker, I think the DC ending seems less satisfying. It takes on even more of a standard ghost story vibe and doesn’t prove very interesting. The theatrical ending isn’t anything special either, but I prefer it. 1408 appears in an aspect ratio of approximately 2.35:1 on this single-sided, double-layered DVD; the image has been enhanced for 16X9 televisions. I only viewed the Director’s Extended Cut for this article. 1408 offered an inconsistent visual experience. Most of the concerns related to sharpness. Much of the film was able to provide adequate to good delineation, but more than a few bouts of softness interfered. These became a moderate distraction. No issues with jagged edges or shimmering materialized, but I noticed some light edge haloes. Source flaws remained absent. In terms of colors, 1408 went with a very restricted palette. Much of the flick threw out dull brown/green hues that looked appropriately bland. A few California shots offered more vivid colors, but the majority of the flick stayed with a limited set of hues. Blacks were acceptably dark but somewhat flat, while shadows seemed decent. They came across as a little dense but not badly so. Mostly the inconsistent sharpness left this transfer as a “C+” image. On the other hand, the Dolby Digital 5.1 soundtrack of 1408 provided a strong experience. With all the horror moments, we got a great sense of creepy atmosphere. Plenty of environmental bits popped up from around the spectrum, and the smattering of louder sequences like thunder or crashing waves packed a powerful punch. The material melded together in a smooth, encompassing manner that made it effective. Audio quality also succeeded. Speech seemed natural and concise, without edginess or other flaws. The score was clear and dynamic, and effects fell into the same realm. Those elements appeared bright and full, as they exhibited solid low-end response when necessary. Overall, the soundtrack impressed. A variety of extras spread across both discs. On DVD One, we get a featurette called John Cusack on 1408. This “webisode” lasts two minutes, 31 seconds and features Cusack and Samuel L. Jackson as they talk about the movie. It’s a promotional piece and nothing more, so you can skip it and not miss anything. Another “webisode” called Inside Room 1408 goes for two minutes, seven seconds. It includes Cusack, Jackson, special effects supervisor Paul Corbould, workshop supervisor Jason McCameron, and producer Lorenzo di Bonaventura. This webisode also serves to promote the film. It tosses out a few seconds of actual info about the sets, but there’s not enough here to make it worth your while. DVD One starts with some ads. We find promos for Planet Terror, Halloween, Death Proof and Black Sheep. The disc also features the trailer for 1408. Via this commentary, we get a reasonably good look at 1408. A smidgen too much praise crops up along the way, but the participants throw out enough useful material to compensate. I’d like a little more introspection about some story issues, but I think we get a lot of solid info anyway. Five Deleted Scenes last a total of 11 minutes, 21 seconds. We find “Contacting Lily” (4:34), “Wrought with Guilt” (1:08), “’I Warned You About 1408’” (1:58), “Tilting Room and Lily Pleads at Door” (2:40) and “Arriving at the Dolphin (Director’s Cameo” (1:01). “Contacting” is just a minor extension/alteration to an existing scene, and I can’t say it really changes it or improves it in a significant way. “Guilt” also offers a minor alteration to a scene in the movie, though it’s a little more effective as it causes a little more despair in Mike. 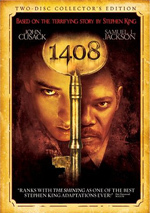 “1408” simply adds Jackson’s character to a scene already in the movie; it doesn’t change things otherwise. “Tilting” is the most substantial new scene, and really the only one that’s not just an extension. It brings us a scare sequence in which the room tilts to keep Mike from the door. It’s more goofy than it is frightening, though. Finally, “Arriving” just provides a very quick shot of Mike on the plane to NYC – with Hafstrom seated next to him. It’s completely extraneous. We can watch these segments with or without commentary from Hafstrom, Alexander and Karaszewski. They tell us a little about the scenes and get into editing and restructuring issues. We learn why the pieces were cut and/or moved in their placement. They give us a good examination of the appropriate issues. Finally, The Secrets of 1408 breaks into four featurettes. These include “The Characters” (7:59), “The Director” (5:13), “The Physical Effects” (4:17) and “The Production Design” (5:23). Across these, we hear from Hafstrom, Cusack, Jackson, di Bonaventura, Corbould, McCameron, production designer Andrew Laws, and actor Mary McCormack. They examine cast and characters, Hafstrom’s work on the film, various effects, and the depiction of the room. Some decent notes emerge from “Secrets”, but the featurettes never become particularly involving. The first two seem particularly blah, though matters improve a little as we look at the technical side of things. “Effects” and “Design” manage to produce some reasonably interesting insights into those elements. Still, the featurettes are never particularly revealing or memorable. 1408 tries to stretch a short story into a feature film with limited success. The movie starts reasonably well but gets less and less interesting as it progresses. This means it ends up as a bore. The DVD offers average picture quality but provides very good audio and a few extras. 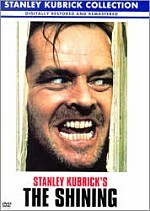 It’s a decent DVD but the flick is forgettable.